Onions are adaptable with long- and intermediate-day onions growing well in Ohio. Photo by Tim Malinich, OSU Extension. The common onion (Allium cepa) is the most popular vegetable in Ohio home gardens. Onions are known to be adaptable, which helps onions to be grown in various regions and zones. This ability is directly associated to the onions’ differing responses to day length. While longer day length promotes flowering in many plants, day length induces bulbing in onions. The amount of sunlight the bulb needs directly relates to the onions’ “group.” Short-day onions require 11 to 12 hours of light, intermediate onions require 13 to 14 hours of daylight and long-day onions require 16 or more hours of daylight. Long-day and intermediate-day onions grow the best in Ohio. Onion grows best in an area that has full sun, loose, well-drained, fertile, sandy-loam to silt-loam soils soil with plenty of organic matter. Onions are easily affected by high acid soils and prefer soil pH between 6.0 and 6.8. Avoid heavy clay soils as they retain water longer after rains and irrigation. Heavy clay soils should be modified with organic matter to improve aeration and soil drainage. Cultivars that are suggested for Ohio are in the following table. This is only a partial list as other cultivars also grow successfully in Ohio. Onions can be grown from seeds, sets, or transplants. Seeds require the most work, but are less expensive. Sets or transplants are more easily grown for optimal yield. Onions can be planted early spring or as soon as the soil is workable. Seeds require the most work but are less expensive. Sow seeds indoors 4 to 6 weeks before planting outside. One week before planting the onion plants you have grown indoors, gradually harden off the transplants by placing them in the outdoor temperatures. Seeds can also be directly sown in the ground once the soil is workable, approximately late March to April. Sow the seeds ½ inch deep. Sets are dormant bulbs that can be planted directly into the ground. Onion sets should be planted 1 to 2 inches deep and 2 to 3 inches apart. Then, once the plants begin to grow, thin them to 3 to 4 inches apart. Plants thinned from the row to create room can be used as green onions. Transplants allow you to pick specific varieties from either a catalog or garden center. When planting, bury the roots and one inch of the lower portion of the plant in the soil. Onion sets should be planted 1 to 2 inches deep and 2 to 3 inches apart. 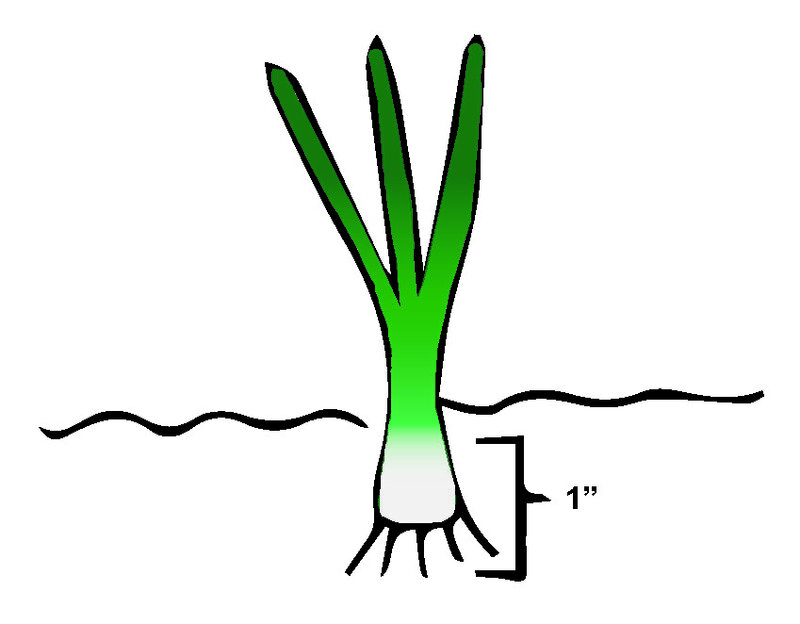 Onion transplants should be planted with 1 inch of the lower portion in the soil. High soil fertility is essential for optimal onion production. Testing your soil pH and nutrient requirements and organic matter content before planting is important for success. Refer to the fact sheet at ohioline.osu.edu entitled “Soil Testing for Ohio Lawns, Landscapes, Fruit Crops, and Vegetable Gardens” (HYG-1132) to learn about how to soil test your garden and “Guidelines for Choosing a Soil Analytical Laboratory” (HYG-1133) for more information on soil testing, lab selections, and procedures used in labs. It is recommended to test your soil every three years; once before planting, and then after fertilizing. If significant amendments were done based on the soil test, take another soil test the following season. Onions require more nutrients than other vegetable plants. Three fertilizer applications of a complete fertilizer is recommended throughout the growing season. The first application applied 40 to 60 days after planting, the second application in the middle of the growing season, and the last application applied four weeks before harvest. Periods of high rainfall or continual irrigation may increase the potential for nutrient deficiencies. Thrips and maggots are the two insect pests that can destroy an onion crop. Knowing what to look for and how to control the pests is critical. Onion thrips (Thrips tabaci) are small, thin insects that can be hard to see without a hand lens. Adult thrips are yellow to brown in color. Typically, the thrips can be found in the inner folds of the onion leaves towards the bulb. Their rasping-sucking mouthparts are used to feed on the fluids from the onion leaves. After the damage has occurred, the leaves take on silvery color with specks on the leaves and often fold over. Thrips thrive in hot and dry weather and feed on small grains such as lima beans, moving to the onions once the grains have dried or been harvested. To help decrease the chances of thrips moving to your onions, avoid planting near small grains or plant resistant/tolerant onion varieties. Onion maggots (Delia antiqua) are a small fly that will lay its eggs in the soil near the growing onion plant. The larva, known as a maggot, feeds on the roots of the onion. As the bulb grows, the onion maggot may continue to feed on it. This will result in bulb rot during storage. To reduce onion maggots, avoid planting onion plants in undecomposed organic matter such as manure. Crop rotation will also help avoid onion maggots. Crop rotation is planting onions in areas where onions have not been grown previously. Avoid planting onions in the same location for numerous years. Botrytis leaf blight is a fungus caused by Botrytis spp. which attacks areas on the leaves that have been previously injured. In about a week after infection white spots will appear on the onion leaves, expand, and cause the leaf tips to brown and eventually the leaves will die. Downy mildew and botrytis leaf blight are often mistaken for one another as their symptoms are similar in the early stages. Crop rotation, soil drainage, and plant spacing can be used to reduce disease pressure. Botrytis leaf blight can be managed by rotating onion crops and related vegetables (e.g., shallots, garlic, and chives) on a 3 to 4 year cycle, to reduce the threat of disease. Good soil drainage will help reduce plant moisture and adequate plant spacing will increase air movement through the onion leaves. Botrytis neck rot is a fungus caused by Botrytis spp. that appears brown, and causes the onion scales to shrivel and become soft. These symptoms are first noticed in storage and develop on onions that are diseased or injured. This disease can be managed by allowing ample time for the onion’s neck tissues to completely dry in the field. The windrow method works well for this. 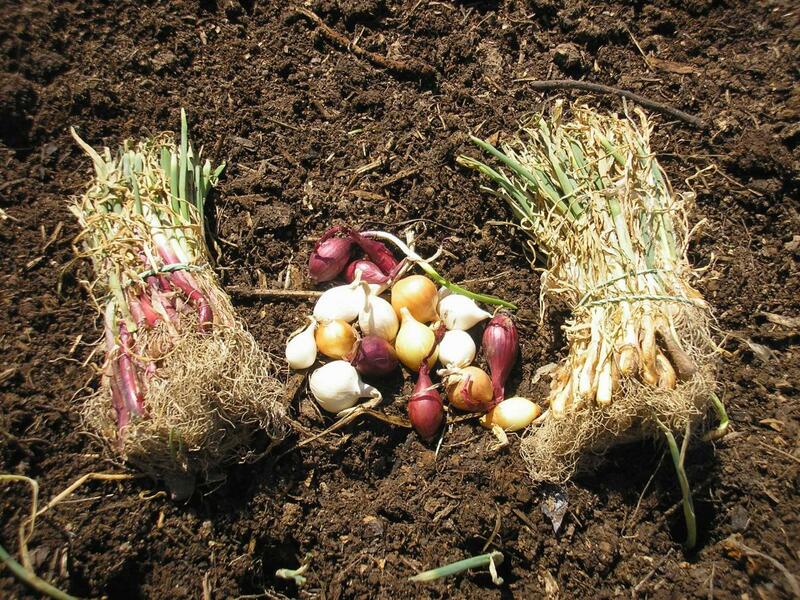 Create a windrow by raking a long line of soil into a mounded row and laying the onions on top of the row to dry. If you must bring the onions indoors to dry, use forced heated air. Avoid injuring the onion when you are cutting the tops and placing in storage. Downy mildew is a fungus (Peronospora destructor) that develops when the weather is cool and wet. It appears on the old leaves of a young plant, usually after the leaves have reached 6 inches. As the fungus progresses on the infected leaves, a white, almost purplish mold develops on the leaf spots. As the mold continues to develop it moves down the leaf until the leaf wilts and drops. To avoid downy mildew, use crop rotation with a three-year cycle in planting areas where downy mildew has been a problem. Good drainage and air movement through the plant leaves also help to reduce mildew. Purchasing pathogen free sets and seeds can help to minimize the chance of contracting the disease. Fusarium basal rot is caused by the fungi Fusarium spp. that appears on the onion in the field and storage. The tops of the onion will turn yellow and wilt while the necks will feel soft. Under moist conditions the neck will be soft, and white mold will be seen between the scales. Under dry conditions the neck will be soft and the bulb will shrivel. The disease will be more severe if onions are being grown in poorly drained soil. Fusarium basal rot lives in soil and can be spread to plants by insects and tools that come in contact with contaminated soil, air, and water. Rotate crops on a four-year cycle to help minimize the disease. Planting resistant cultivars and managing soil insects will also help reduce disease pressure. Weed control is difficult with onions because the crop has thin leaves that do not shade out emerging weeds. Several options are available for weed management and control. Cultivation is one option; the onion beds should be designed with row spacing to fit the cultivation equipment. Be careful not to damage the onion bulb or plants while cultivating. Black plastic mulch can be used to cover the area between plants and reduce weed pressure. Crop rotation will also help with certain weeds. Herbicides can be used that list onions on the label—always read and follow label directions. Onions may be harvested when the majority of the tops have wilted, which is approximately 90 to 120 days after planting. Gently pull the bulbs from the soil with the tops attached. To prevent rot, bulbs need to be properly cured. Curing is the process of drying the cut top or neck of the bulb. This process can take two to four weeks, or until the outer scales of the bulb are papery thin. Cut the tops approximately 1 inch above the bulb. Curing is best done in a shaded area outdoors on sunny, breezy days; however, weather conditions may not permit this. If you are experiencing wet and humid weather bring the onions indoors for curing. Store onion in a moderately cool (32 to 40 degrees F) and dry area in ventilated containers such as a mesh bag, wire basket, or open crate. Onions will begin sprouting if temperatures are too high or freeze if temperatures are below freezing. Inspect and remove damaged or rooted bulbs on a regular basis. Original authors: James D. Utzinger and William M. Brooks, The Ohio State University, 1984. Second author: Marianne Riofrio, Ohio State University Extension, Revised in 1992. Graphics by Lea Kimley, The Ohio State University, 2018. Bonnie Plants. 2017. Bonnie Plants Product Catalog. https://bonnieplants.com/. Accessed on October 18, 2017. Cornell University. 2016. Cornell University Vegetable Growing Guides. gardening.cornell.edu/homegardening/scene91d8.html. Accessed on March 13, 2017. Onion Production. 2016. Penn State Extension. http://extension.psu.edu/business/ag-alternatives/horticulture/vegetables/onion-production, Accessed on March 13, 2017. Yard and Garden: Growing Onions. 2016. Iowa State University Extension http://www.extension.iastate.edu/article/yard-and-garden-growing-onions, Accessed on March 13, 2017.